Polyhymnia “Polly” O’Keefe has been given an unexpected opportunity. Maximiliana “Max” Horne, an older woman who lives near Polly’s home on Benne Seed Island, has taken a special interest in mentoring her. As part of this mentorship, Max has arranged for Polly to visit Greece, and to work as a go-fer at an international literary conference on Cyprus. While in Athens, Polly becomes acquainted with Zachary Grey, who is as charming and as undesirable as ever, and she does her best to work through her feelings about the terrible way Max betrayed her before she left home. Throughout the time I have been reading each of L’Engle’s Austin/Murry/O’Keefe books, I have favored Vicky over Polly. Though both girls are portrayed as somehow special, Vicky has always seemed more believable and relatable, while Polly has always struck me as too perfect and too unrealistically good. This story is the first one where Polly has actually seemed like a human being. I was pleased by this for the sake of this particular story, because I enjoyed spending time with a main character who had some layers and some emotional depth. When considering the continuity of the overall series, however, the Polly of A House Like a Lotus is not the same Polly of the earlier books. Polly actually reminds me a lot of Vicky in this book - which is fine with me, because I like Vicky, but somewhat odd when one views the entire series as a unit. I read one interesting blog post where Mari Ness of Tor.com speculates that L’Engle may have actually set out to tell this story about Vicky, not Polly, and then changed her mind when she realized it would be difficult to cause pain to a character she identifies with so closely. That argument makes a ton of sense to me, and as Ness points out, it would explain why we’re forced to put up with Zachary Grey again. Ness’s post and many others that I read also share another common interpretation of this book that I have to admit I totally missed. We are told in the book that Max is a lesbian, a fact which causes varied reactions from Polly, her parents, her siblings and the kids at Polly’s school. At the critical moment where Polly feels so horribly betrayed by Max, it seems that everyone - Wikipedia, Goodreads reviewers, and authors of scholarly articles - believes Max has made a sexual pass at Polly. I did sort of expect something like that to happen, based on how upset Polly was and how long it took her in the narration to get around to describing the night of her betrayal, but I have read the passage where it happens at least ten times, and I still don’t see definite textual evidence that Max did anything to Polly other than drink too much and scare her. It makes sense to assume that more happened, but had I not read anything about this book before posting this review, I never would have realized that Max made any sort of overture toward Polly. Despite its weirdness, though, I really loved this book. I enjoyed catching up with the O’Keefes, and learning of the latest additions to their family. I thought Polly’s relationship with Renny was sweet, though a bit strange given their age difference. The flashbacks to the growth of Polly’s friendship with Max were very effective, and I enjoyed moving back and forth in time as Polly reflects on what has happened and does her best to forgive. I also appreciated the obviously Christian message about forgiveness. Polly desperately wants to forgive Max, but she must first work very realistically through her layers of grief. I appreciated that there is never any doubt as to whether Max should be forgiven, but that it is still difficult for Polly to get in touch with her again. I also thought the second part of the book, where Polly attends the conference was a bit touchy-feely, but also moving in its own way. Most of the characters didn’t seem realistic, but there was still something interesting about the way these people from so many different places became like a family to Polly and to each other. 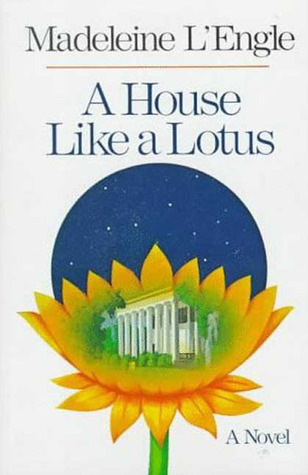 A House Like a Lotus has its problems and its critics, but I would place it in my top five of the L’Engle books I have read so far, and I would say it is my favorite of the O’Keefe series. I am actually looking forward to seeing Polly again in An Acceptable Time, and I’m eager to finish this reading exercise, hopefully by the end of this summer. Only three titles left - Many Waters, An Acceptable Time, and Troubling a Star. I'm so glad you liked this! I read it for the first time during exam week of my first semester in college, and loved it. I've read it at least once a year since, and even though I've come to see the flaws a little better, it still works for me.